Here is the updated version of the banner size, with additional information. If you’re too lazy to read my post, or you have a deadline in five minutes, the Facebook banner size is 851 x 314 pixels. If you do have the time and want to be pleasantly entertained by my… umm… grandiloquence, please carry on. I had trouble finding accurate pixel dimensions for facebook profile picture and banner sizes, so I thought it would be fun to create my own. And yes, that was a lot of fun! What better thing to do on a Friday night? I miss the days of being a graphic designer. The standard Facebook profile page and other pages are different, but not by much. The profile picture simply drops by 17 pixels on business and fan pages, which can be a bit confusing if you do a google search for the actual pixel dimensions. I found that in general, the dimensions weren’t very accurate and possibly ‘eye-balled’ to get close enough. But for sticklers like myself, I simply can’t handle inaccurate pixel dimensions (blaarghh!). Anyone on the internets can copy and paste information, but it’s important that that information is accurate, otherwise false information can spread like wildfire. Not that facebook pixel dimensions are all that important, but if I can save someone a couple of minutes of head scratching, I’ll be happy. The numbers in the diagram above are 100% accurate down to the pixel level. I checked and double checked them at 800% in Photoshop. The JPG file can be opened in Photoshop to see the perfectly aligned guides as well, so feel free to use that as a template. If the current Facebook page design changes, I’ll look into updating the diagram. Thanks for the informative information! Thank you very much! Really needed this! You saved me a lot of time from doing the same thing with Photoshop. This page was greatly appreciated. this is wonderful, thank you! I’m rather neurotic about things being precise too, so thanks a lot! Perfect! I have another question. How about my own facebook profile dimension and not a fan page? 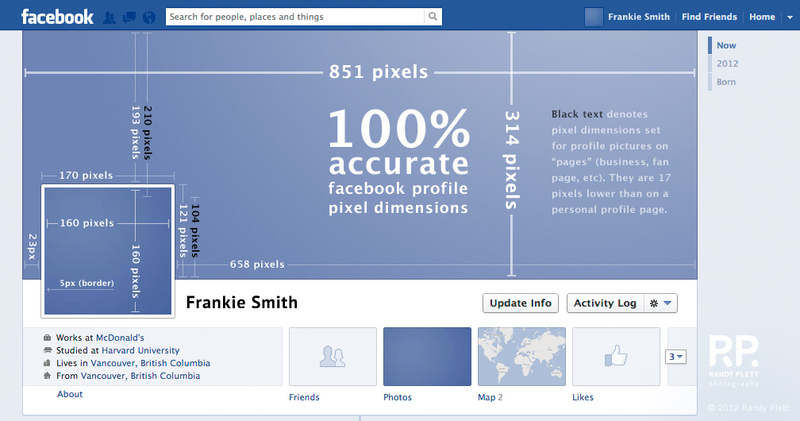 Thanks Fedya, the graphic shows the facebook banner size for both fan pages and personal pages. Good question! I suppose they suggest that for either two reasons. 1. the image can be scaled up with no loss in quality, if needed. 2. Facebook most likely compresses images, it may be better to upload a higher resolution file that will reduce compression artifacts when scaled down to normal size. Now, is it 314px or 315px? I had measured 314 pixels at 200% in photoshop. But if you upload an image at 315px, it won’t make a discernable difference. Thanks for the effort you put into this Randy! Much appreciated. Just the info I needed . Thanks. You Rock Randy Plett, thanks for the info!!!! Thanks everso much.! Have a lovely day. Thanks! 😀 If I can get around to making PSD template, I’ll post it. I think the Profile Pic size has changed to 180×180 now. Thanks a lot for the info and the fact that you put it above your post. I kept reading because of that and not despite of it. Thanks. Thanks for this. It was pretty tough to get the right size. Tried your dimensions and they worked perfectly. Thank you for this. Very helpful. What about the mobile zone? I wanted to thank you for the dimensions. I’ve been craving the “proper” specs for a while and stumbled upon your site. Thanks again! Hey. All those one sentence comments drove me to write a longer one. I’m such a crabbit old soul that on bad days I sometimes don’t approve comments on my site that just say “awesome work man” or some other empty vacant tippy tappy rattle on the keyboard. The only reason I arrived here was that I was looking for measurements for a Facebook banner and on an image search it was just obvious that yours had some care about it. Thanks. And congrats on being too busy doing what you love to keep your blog updated. More power to your elbow. This from a fellow ex graphic designer who was miles less of a stickler than you but didn’t quite descend all the way into ‘eyeballing it’ territory. Awesome photographs too by the way. I did look. Cheers.